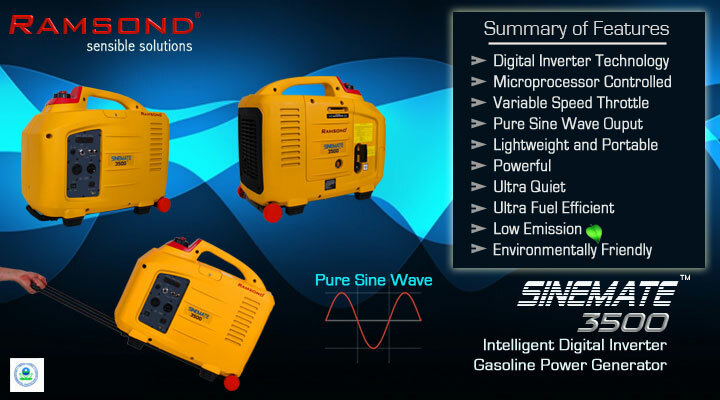 Ramsond introduces its newest generation of Sinemate 3500 Portable Digital Inverter Gasoline Generator. 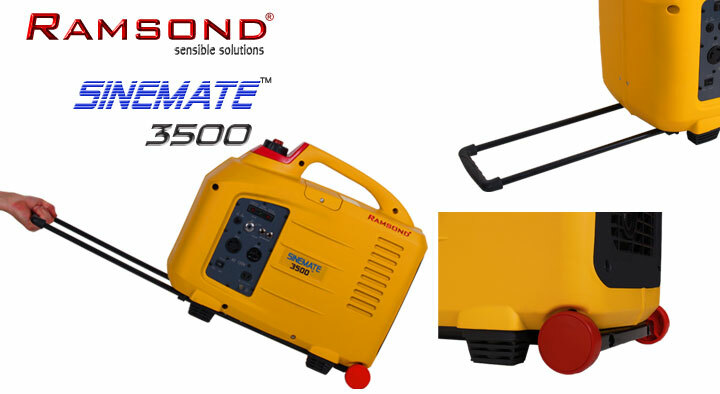 Advanced engineering and state of the art manufacturing techniques make the Ramsond Sinemate 3500 the most reliable and sophisticated portable inverter generator in its class and one of lightest and quietest portable inverter generators in the market. Yet, despite its small size and weight, the Sinemate 3500 packs a heavy punch; with a newly upgraded 150cc engine, delivering 3100 watts of maximum power. Ramsond's pure sine wave digital inverter technology also ensures delivery of highly stable and constant voltage to ensure the safety of sensitive equipment. Furthermore, the digital inverter technology makes this generator far more fuel efficient and environmentally friendly than conventional generators. If you have used a traditional/conventional generator, you have probably experienced that when there was a fluctuation in the power, the lights dimmed and then went back to full power. This fluctuation of power is quite dangerous to many modern-day high-tech and sensitive equipment. For example, if your computer was powered by a conventional (non-inverter) generator and the voltage fluctuated, the computer would shut down prematurely. This premature shut down not only causes inconvenience, but often leads to loss of unsaved data and files. Furthermore, sudden fluctuations of power can often be fatal to many of these types of equipment. However, You will not experience this fluctuation of power using an inverter generator. An inverter generator produces 3-phase AC power at a high frequency. This high frequency AC Power is then converted to DC power. In a final step, the DC power is then inverted back to AC at 120 volts, 60 Hz for use by common appliances and equipment. Ramsond Sinemate inverter generators are much quieter than conventional generators. This is because Sinemate inverter generators do not run at full speed all the time. As mentioned, Sinemate inverter generator is controlled by a microprocessor so it only produces what is needed at any given time. Ramsond Sinemate inverter generators are even much quieter than many other inverter generators in the market. Ramsond Sinemate inverter generators are equipped with sound dampening insulation materials that further decrease the level of noise even when running at full speed and maximum load. The quiet operation of the Ramsond Sinemate inverter generators makes them a perfect candidate for use in RV's, boats and at campgrounds, recreational sites, exhibition booths and concessions stands. Ramsond Sinemate inverter generators produce pure (true) sine wave power, the same type and quality of AC (Alternating Current) power produced by the utility grid. Pure sine wave output is a far superior (cleaner) form of output power as compared with modified sine wave or square wave power. Increasingly, most modern electrical or electronic devices such as laptop computers, stereos, laser printers, sensitive medical equipment, digital clocks, kitchen appliance with multi-stage timers, and variable speed or rechargeable tools can only function properly with pure (true) sine wave power. Similarly, pure (true) sine wave inverter power may be needed for maximum efficiency of inductive equipment, to reduce audible and electrical noise in devices with audio-visual components and to enable proper functioning of fluorescent lights with electronic ballasts. 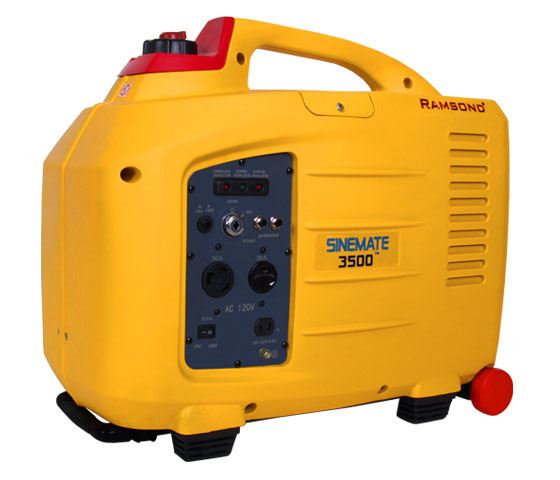 Ramsond Sinemate 3500 Inverter Generator is extremely compact and lightweight. Additionally, to assist portability, it is uniquely equipped with a trolley, retractable arm and enlarged rear wheels. Much like a suitcase, it can be easily wheeled along on any even surface. Ramsond Sinemate 3500 is extremely user-friendly. In addition to manual/recoil start, the new generation is now equipped with an electric starter/ignition system (battery included). Therefore, Ramsond Sinemate generators are designed to start with utmost ease in any condition. The controls are also simple and user-friendly. So, regardless of your intended use, the Sinemate inverter generator is an all-around convenient, portable and easy to use power source. 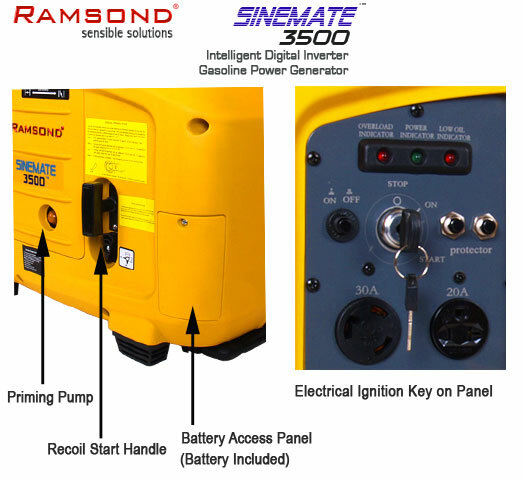 Electric Starter (Battery Included and Installed) is now a standard feature for the Ramsond Sinemate 3500. The multi-function control panel of Sinemate is designed with both functionality and safety in mind. 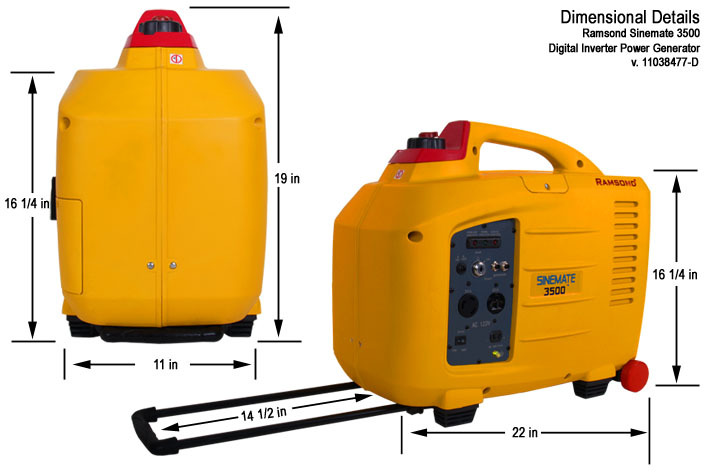 Upgraded from the previous generation, the Sinemate 3500 panel is now equipped with one standard NEMA 20 Amp 120V socket (standard for US and Canada), and a 30 Amp, 120V L5-30R receptacle , which makes it possible to use this generator to run virtually any appliance, including most RV air conditioners. The panel is also equipped with a "\ /" style 12 Volt, 8.3 A DC socket for battery charging (12 Volt DC plug and wire clamps are also supplied). The ECON (Economy Mode) button, when turned on, allows the generator to run at a lower idle speed to conserve gasoline. 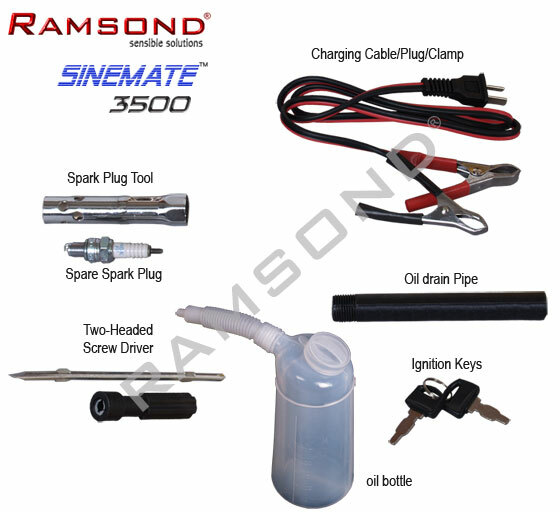 Each Ramsond Sinemate inverter generator comes with a double headed screwdriver, spark plug wrench, spare spark plug, oil drain pipe (for changing oil); battery charging wires and clamps with "\ /" plug; two ignition keys and an oil bottle. The battery is also included (not shown) and is located inside the generator. Is this generator suitable to run my camper/RV appliances or air conditioner? The Ramsond Sinemate 3500 generator is now equipped with a special 30 Amp 120V receptacle which allows the operation of most 110V air conditioners or other appliances with start-up current of 25 Amp or less. 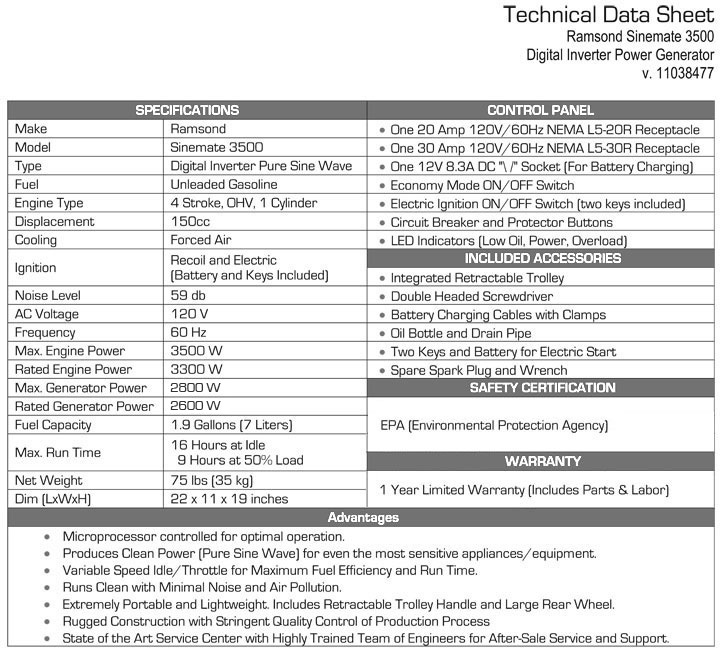 Please check the specifications of your air conditioner for further details. Many other generators in the market falsely claim to run RV air conditioners. However, unless they are equipped with a special 30 Amp receptacle, they will not work properly. Q Is this generator quiet enough for camping sites? Yes - The Ramsond Sinemate 3500 generator meets or exceeds most of the campsite regulations concerning noise disturbance. The Sinemate operates at about 59 db at 21 feet distance, which is in compliance with most, if not all, campsite noise regulations. Q What happens if this generator requires services? Simply send your generator to our service department. We recommend that you keep the original boxes and packaging foam for ease of transportation. Our technicians are fully trained and certified to repair this product. Q How reliable is this generator? With over 40,000 units sold in the last 4 years, this generator is among the most reliable and advanced generators in the world. Q Do you service other brands of inverter generators? No. We receive many inquiries from consumers who have purchased similar generators. They often complain that the retailer provides no after-sale or warranty service. We sympathize with the plight of these defrauded consumers. However, we can only provide service for Ramsond line of generators. We have a fully equipped technical and service department with certified technicians and engineers. We stock all components necessary for repair and service. Each Ramsond Sinemate series generator comes with a 1 year Limited Warranty covering both parts and labor (at our designated service center). We maintain a constant stock of all components and replacement parts. During the term of the warranty, should you require service, simply return your generator to our service facility. Your generator will then be repaired or serviced promptly and returned to you. This is indeed the best warranty available as compared with other would-be competitors who simply provide a parts only warranty. Furthermore, we have knowledgeable and qualified technical and service personnel on staff available to address any of your technical questions. Simply email or call us and we will promptly address your questions. Each Ramsond Sinemate generator is guaranteed to be BRAND NEW and in original factory packaging. When you purchase your Ramsond inverter generator here, your investment is protected. We employ the best packaging techniques so your order arrives to you in perfect condition. All orders are shipped within 1-2 business days of receipt of payment. We ship to physical addresses only. We cannot accommodate shipments to a P.O. Box, APO or FPO. Ramsond's knowledgeable technicians and engineers are trained to answer all technical questions. Similarly, Ramsond maintains state of the art repair and service facilities, equipped with some of the world's most advanced equipment, should your product require service or repair. We have the answers and solutions that you need. You can email or call us and one of our knowledgeable and certified technical agents will be ready to assist you with all of your questions. You may call us at (248) 363-8302 during normal business hours. You may also email us at sales@ramsond.com or click on the Contact Us button below to submit your questions and/or comments. I have owned my 3500 watt Ramsond for about four (4) years now and it has never let me down yet. I read the other reviews and I'm surprised as I bought my unit online it came with all keys and equipment, I have no issues starting my RV air conditioner with it, I even had to use it for my acreage sump and septic tank pump out for 8 hrs when the power went out during a monsoon and it saved my basement from flooding. I have no worries recommending this little generator to others. Have a great day. Its not a bad generator for the money. I had to adjust the idle so it will run my camper AC unit. The AC will kill the generator if I try to have the AC run on the thermostat. I have to keep the AC at the lowest setting. The generator cant start the AC in eco mode. the engie has started to leak oil out of the cylinder head. Hard to find repair parts.